It is ILLEGAL to throw electronics and white good appliances in your Sioux Falls trash bin and they are NOT ALLOWED in your recycling bin. They cause serious problems at the recycling facility and are a danger to the environment if disposed of improperly. Sioux Falls Household Hazardous Waste Facility – Free for Sioux Falls area residents. SEAM – For any items HHW does not accept (i.e. residential limits or business equipment) or for certified data destruction. NOT ACCEPTED AT MILLENNIUM: Thank You For Keeping These Out Of The Single Stream And Keeping Recycling Running! There are 0 comment. 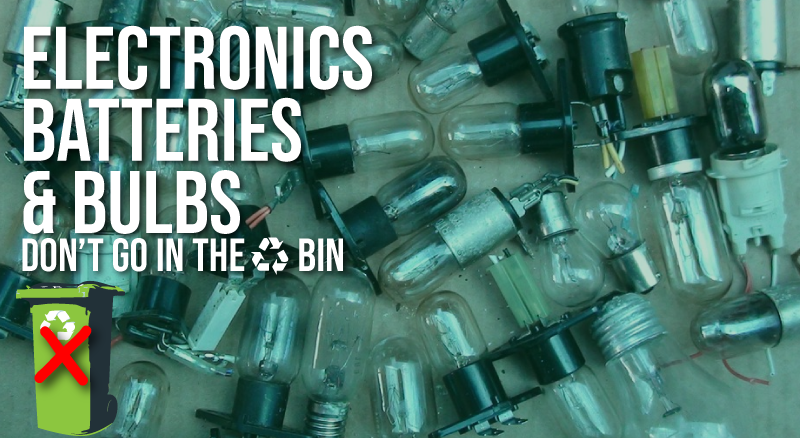 on "Electronics, Bulbs & Batteries Don’t Go In The Bin"